MINIMUM STAY 1 week June through August. ATTENTION, ATTENTION, ATTENTION: Rates are based on season, minimum stay, and number of persons in group. PLEASE SEE RATE/NOTES SECTION FOR DETAILS as the instant quote feature on the set up of VRBO's new website is misleading and inaccurate. We do charge a dog fee, inquire about details. Welcome to the Lake House for every season! Nestled between poplar covered sand dunes, this contemporary 3 bedroom (sleeps up to 10) ranch style home offers partial views of both Lake Michigan and North Grand Mere Lake. The home includes private sandy beach access on Lake Michigan and a wading stream. Due to recent high water levels, we have experienced significant shoreline erosion over the past couple of years. The beach is smaller than the pictures depict. Any questions, inquire with owner. Among many amenities, it includes a private inground swimming pool, six-person hot tub (open year round) and large wrap-around deck. Come to enjoy serene views, beautiful snow falls, wildlife, endless sunsets, relaxing walks and a private sandy beach. If you like action, you're only 10 to 20 minutes away from the popular destination towns of St. Joseph and New Buffalo. We're located at exit 22, off of I-94. Stay at the Lake House for a week or a weekend and enjoy it all! 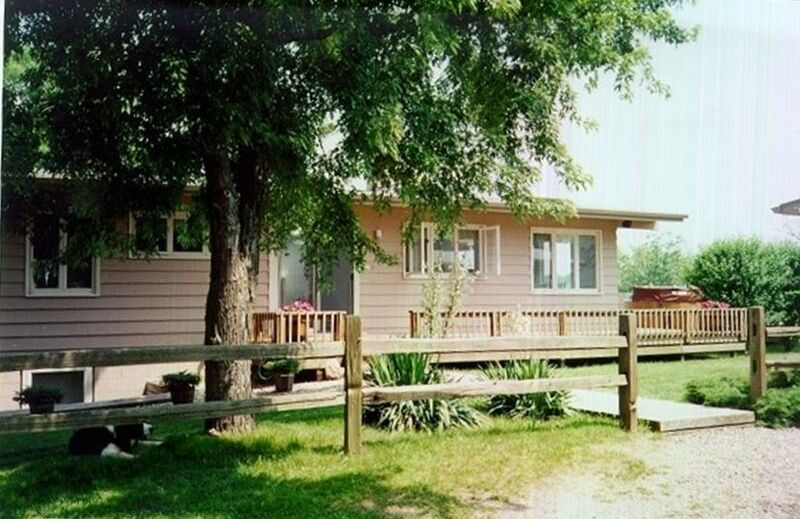 Keywords: Contemporary Ranch style home w/private Lake Michigan beach access, swimming pool and jacuzzi hot tub. Your hosts are life long residents of the community and offer a wealth of knowledge with respect to local restaurants, activities and attractions. And, residing in the same lake front neighborhood, they are quick to respond to your needs or questions. This contemporary 3 bedroom (sleeps up to 10) ranch style home offers partial views of both Lake Michigan and North Grand Mere Lake. The home includes private sandy beach access on Lake Michigan and a wading stream. See more details on beach in description. Among many amenities, it includes a private inground swimming pool, six-person hot tub (open year round), charcoal grill and large wrap-around deck. Come to enjoy serene views, beautiful snow falls, wildlife, endless sunsets, relaxing walks and a private sandy beach. If you like action, you're only 10 to 20 minutes away from the popular destination towns of St. Joseph and New Buffalo. We're located at exit 22, off of I-94. Stay at the Lake House for a week or a weekend and enjoy it all! Private beach (see more beach details under description), private inground swimming pool and private hot tub. Also partial view of Lake Michigan and unobstructed view of North Grand Mere Lake. (1.25) The home has one full size bathroom with double vanity sink, tub/shower and toilet on the main level. There is a double vanity and shower in the lower level. There is a grand view of North Grand Mere Lake from the South side of the home. There is a small view of Lake Michigan from the West side of the home, but not totally unobstructed. There is a seasonal stream on the private beach that flows intermittently from North Grand Mere Lake to Lake Michigan. Fun for all! The two main floor bedrooms are air-conditioned. The home is fully stocked with towels and linens. Large sliding glass door with floor to ceiling windows allow a great view of North Grand Mere Lake. Also has sky lights, vaulted ceiling, gas fireplace and entertainment center. Home is fully equipped with dish & glassware, silverware, pots and pans. The dining table seats 6 people and counter bar seats 4 people. Picnic table outside seats 6-8. There are 3 televisions with basic cable tv. Three small stereo systems located in living room, basement and master bedroom. There are a variety of books and magazines to read. There are miscellaneous puzzles and games located in the entertainment center. The deck wraps around the South and West sides of the home. There is also cement decking around the pool for sun bathing and picnic table. The pool and hot tub are private and for the exclusive use by the tenant. The hot tub and pool are private and for the exclusive use by the tenant. Bonfire pit, full basement, 3 TVs, vaulted ceilings, opening skylights, private Lake Michigan beach access and an in ground private pool and hot tub. Just returned from a ladies weekend. While not Lake Michigan lakefront, it is literally across the road and just a short stroll to a small beach. There is a beautiful view of a smaller lake enjoyed from this home and deck. 5 ladies were quite comfortable here. We found games located inside the ottoman located under the TV, which we enjoyed, along with the hot tub. The home is very clean. Shelly was available and communicated kindly and clearly, making us feel very welcome. We recommend this home for your vacation or weekend away! We had an enjoyable weekend at the lake house. The pool and hot tub was a good time. The house was clean and came with all the essential utensils which was convenient. The basement was a little musty. There was also just one toliet in the upstairs bathroom. Overall, we really enjoyed the time spent at the lake house and would recommend it to anyone who is looking for a relaxing weekend. What a great vacation! Shelly was very accommodating and just a phone call away. The kitchen had everything we needed. The neighborhood was just gorgeous. Very clean house and pool and the beach was just a short walk away. Highly recommended! We will be back! We were scrambling to find a rental in the St. Joseph area and only had about 2 weeks to find something. This house happened to be available in that time frame and it's a miracle, as it was absolutely perfect for our family of 5, including 3 girls ages 8 and under. The house itself was a blast to stay in, we can't say enough about it. The pool itself is fantastic especially if you have kids, who also loved the hot tub on the deck. There's a private beach available within a 10 minute walk. The house is secluded off of a private drive in the woods right off of Lake Michigan. All we needed to bring with us were clothes, toiletries, food and beach towels, everything else was completely stocked. As great as the house was, the location of this house was equally as great. While the house itself felt isolated, it was a 5 minute drive to the closest Meijer as well as anything we could want in Stevensville. Better yet, it was less than a 15 minute drive to St. Joseph's Silver Beach area, and we spent a large part of our week in that fabulous town. Can't say enough about this place, thanks guys for an unforgettable week! Pool and hot tub were amazing. House was nice and well stocked with linens. Only issue was basement with 3rd bedroom wa really musty smelling, due to heavy rain the week before. Thank you very much for your review. So glad you enjoyed your time at the Lake House. You are correct with the heavy, heavy rains that we had, we did get moisture in the bedroom area. We have taken steps to mitigate the problem. Please keep us in mind for a future visit. Wine Tours, Grand Mere State Park, Warren Dunes State Park, Curious Kids Museum, Captain Mike's Fun Park, The Heritage Museum, Silver Beach and the Piers, out door concerts at St. Joseph's Shadowland Pavillion and Bandshell, Krasl Art Fair & Center, ice skating at Howard Ice Arena or North Grand Mere Lake Park, snowshoeing, ice sculpting, Southwest Michigan Symphony Orchestra, The Box Factory for the Arts, The Mendel Center-Performing Arts, The Twin City Players, Notre Dame Football Games and much more! ATTENTION: Rates are based on the number of persons in your group. A maximum of 10 people are allowed on the property at any given time. Minimum stay is 2 nights in off season Mid September-May rates: $180.25 per nite maximum 2 people, $257.50 per nite maximum 6 people, $437.75 per nite maximum 10 people. Prime season June-August minimum stay of one week. Weeks go Sunday to Sunday. Rates per week: $2008.50 maximum of 6 people, $2575 maximum of 7-10 people. Additional fees for dogs maximum of 2 ($22.66 per day or $154.50 per week per dog) inquire with owner on pet details. 6% MI tax and refundable security deposit of $200 required. REFUNDS on rental fees & tax: MINUS fees imposed on Owner from VRBO's required banking method. 100 % up to 60 days prior to your arrival, 50% up to 31 days prior to your arrival, non-refundable 30 days and closer to your arrival in the event of cancelation. Security deposit 100% refundable in the event of cancellation and refundable after your stay, provided there is no excessive cleaning to be done upon your departure and there are no damages.